... on the Curious Bruise. Left:: I was cutting some wire yesterday and I accidently poked my left index finger with the end. It bled quite a bit but you can hardly see the puncture, now. 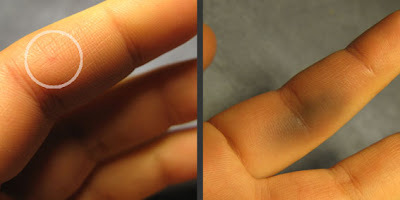 Right:: This is the bruise that has come up on the other side of that finger. How about that!? ... on the broken w.
Look what just happened when I was photographing 'wheelie'. I'm inclined to think it's a sign I shouldn't list 'wheelie' but I'm going to ignore it. How did I break it!? For the purposes of photography I Blu-Tack the letters to my wall, as it's only temporary. 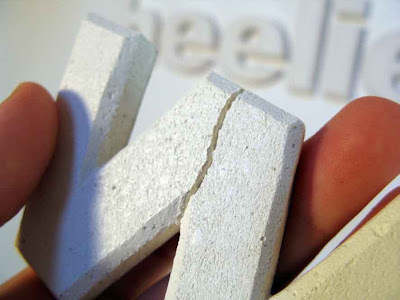 For large letters like 'w' I use three little knobs of it - which of course, now that I think about it, can put undue pressure on the middle of the letter when I'm pressing it onto the wall. It acts a bit like breaking a stick over your knee, and from now on I'll be using two knobs max. ... on mould and fungus. A Photoshop restoration. 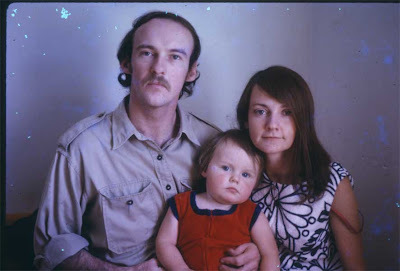 This slide of my parents and brother was dark and had mould/fungus growing all over it, but I really loved the photo and set myself the challenge of restoring it digitally. My mum told me to airbrush out her bra strap but that's one of the things I love the most about this photo, so I didn't. This was my first Plaster Wall Word. These first letters were pretty rough, and unsealed. I glued them on using contact cement and 5 years later they're still stuck firmly. 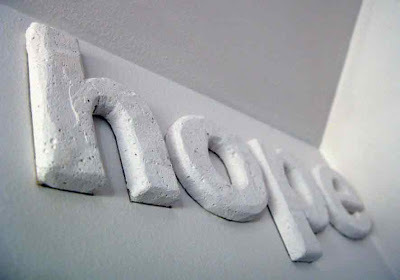 I chose 'hope' because I wanted something on my wall that would remind me that however bad I was feeling about something, it was a pretty good idea to have some kind of notion that the future could be good. New 'hope' (carved way more carefully, and sealed!) may be found here. The office I work in had moved to an industrial area. On the chain-link fence was an old sign, which looked like all the lettering had worn off it. It was just a rusty orange piece of tin that I thought would be great to make into some Beastie Sea Creatures. I knew I had to have it, so I gave G*** my pliers and got him to snip it off for me one night. He put it down the side of my desk during his night-shift and I transferred it, wrapped in paper, to my car the next day. When I got home that night I tore off the paper and gleefully ran my hand over the lovely surface, imagining it as a Lobster Beastie, definitely a Crabby Beastie. I turned the sign over to check out the other side - to find this beautiful weathered lettering: the sign had been facing 'out' through the fence, not 'in' as I'd assumed! How can I possibly take my tin-snips to something so beautiful? ... on little sharp bits of tin. 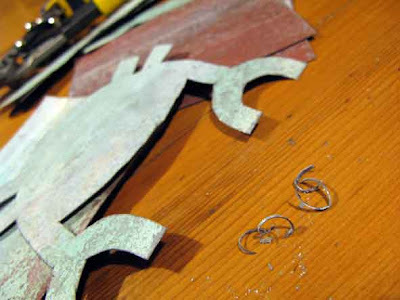 Dave came around the other day, and saw these little offcuts from making a Beastie sitting on my table. "Em!" he said, poking dubiously. "Have you cut your toenails again?!"